Past Chinatown, Rosedale Cleaners, I'm a daydreamer. Sittin' back, reflecting, surrounded by people but in solitude. Clued into my inner self. I have a peace not bought by wealth. Sunrise, midday or sunset. Hot, cold or wet. God's mighty brush paints the planet. Clouds streak across the sky while busy people bustle by. Too concerned on their own state to appreciate the beauty of the landscape. Shaped. The miracle of human life. A baby's eyes glow with excitement. A couple cuddles, a man is pondering his troubles. Not even a stubble of a beard on my chin. Still in my time roaming, I've been through many cycles. Some people I've seen are blazing flames, others icicles. On a warm summer's day suited for licking popsicles, I remember the melted juice messin' up my face. But still loving it all with the wonder seen only in a child's gaze. Raise up out of the grave. It's all a mind game but you don't have to be enslaved. Regain and rebuild. Yeah. All different faces, some old and some young. Europeans, Africans and Asians from the land of the rising sun. Can't you see that we all one people? The human race. One people with more than one face. The frustrated chase for meaning leads many to death. Robbing themselves of they own breath, or robbing someone else. Check my pulse when I'm dead, it may not be there, but that is not the measurement of life. My spirit lives on in all those who chose to invite and experience moments with me. Then I will enter the palace of the Almighty, the supreme royalty. The one who understands infinity. We ain't stuck in this war with no infirmary. Don't try and worry me that I ain't up to par with Hollywood stars. Squares, chopped up my thoughts into sections, and I chose the ones that lead me to God's protection. Even if it does come with some rejection. Monotonous tone, homogeneous drone, plottin' this route, trying to figure out when I get home. Ears blown from a walkman turned up a little too loud. Not at the back of the bus like segregation, no blacks allowed. Sometimes I'd prefer a car ride, but yo I spent all my cash on developing my musical sound. Skin brown, sometimes no one sits beside me. So many faces frowned; you'd think their brother drowned. Many potential kings, waiting to be crowned. But coronation never comes- chained by habit. See an opportunity? Stretch yourself and grab it! Dagnabbit, you can't pull a rabbit out a hat without first trying and failing. Maybe you'll get a rat from the top. Like myself. I know I excel in nappiness, that's why I get haircuts. Its the track that most of you guys know us by, a catchy feel-good rap song that takes place on a bus route in Calgary. Its the main reason DFE is around today- the positive feedback that Mount Pleasant generated outside of the traditional Canadian hip hop market (which is extremely small in terms of grassroots support) fueled us to keep going. But how did it start? Well, if we rewind to 2000, I was just getting my feet wet in the hip hop scene. My friend Tim was writing a track with me over a beat I had produced. He saw the #2 bus schedule on my desk and incorporated it into his lyrics. The song ultimately never saw the light of day, but later that year I was on the bus coming home from college and I started to pen the song while riding and observing the people onboard. I was inspired by Tim's line and created the chorus. The writing wasn't done over a beat, and back then I didn't have a strong sense of rhythm, I would write and then try to add a rhythm to it after, creating a very unorthodox and colourful flow pattern. The song was unreleased until 2002... I had rapped it live a few times at various events over different beats but never recorded it (beyond a sloppy four-track version). In the Spring of 2002, I was starting to record with Cosm and needed songs to put over the beats he would give to me, since our goal was to finish the album in about a month. When the beat for the version that you all know was created, I started reciting the lyrics over it and it sounded like a good match. The track was recorded during our first visit to DJ Nato's Up in Arms studio in Edmonton (he is an amazing hip hop engineer/producer who has also recorded Cadence Weapon, Touch and others). Later that year, the song started getting a lot of airplay locally on CJSW. I uploaded the track to NMC in Spring 2003, and it was first played on their FM show in the summer of 2003, funny enough while I was doing an internship with CBC Canada Now in Edmonton. It took off from there and was one of NMC&#39;s top tracks of 2003. Since, the CBC love has grown tremendously. The track was re-recorded in late 2003 for the professionally manufactured version of our Conquest album, released in 2004. My flow on this version was a lot more in the pocket, but since the original already had so many plays on NMC, I left it as it was for the site. In the song, I am basically speaking encouragement to people everywhere. There is a strong message to step back and appreciate life while you have it. Its extremely honest and true to my unique character at that time. 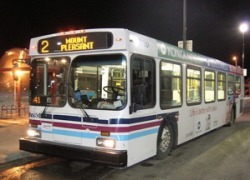 I have riden this bus since my family first moved to the Highland Park neighbourhood in Calgary back in 1990. There wasn't too many young families there and it wasn't exactly the most diverse ethnic makeup. My mother is a strong Jamaican lady, divorced with four kids. She managed to save up enough money to buy us a house in this community, and the #2 is the bus I would ride to go downtown. I still take the bus to work downtown, but not so much the #2. Sorry to say, folks, but I am now also a driver, look out world. We also did a remix of the track for our second album, Invasion, which mildly poked fun at the original, uniting with some kats from Edmonton and changing the #2 bus into the #2 highway. Reaction has been great. I can't even count the amount of people that have come up to me and told me how much they love the song. Calgarians often say it's great for them to hear the local references... but aside from the chorus which mentions the bus route's name, the only things I refer to are Chinatown and Rosedale Cleaners, becasue the leg I would take on the bus isn't the most eventful. Rosedale Cleaners; signature large building on the corner of 4th St. NW and 16th Ave. has actually been torn down and relocated to a smaller building since I wrote the track. In the original-original, never released, I also mention James Fowler High School, which is where I get off the bus. Anyway, the song extended our reach to casual fans who don't usually listen to hip hop, and we have been given a lot of opportunities such as being featured in &quot;Much does Calgary&quot; in 2005, being flown out to Ottawa in 2005 to perform at the Alberta Scene Festival, performing at the 2004 Western Canadian Music Awards, performing at the 2005 &quot;Brilliant City&quot; Alberta Centennial celebration and a lot more.